Mattress covers are as important as protective cases for expensive smartphones. A mattress cover is the most essential accessory you may need for your mattress. Human bodies create quite a mess. We produce skin oil, shed dead skin cells and perspire while sleeping. And if we are drinking something in bed, we often spill stuff too. All of these combined create a wet spots, spills and stains which soaks right through the sheets into the mattress. Having stain on your mattress makes the warranty void, therefore it is necessary to get a mattress cover for your mattress to keep it clean, in better condition. But most importantly; it prevents the bed bugs and dust mites from making their way into mattresses. A number of allergies like runny nose, sneezing, wheezing are caused by dust mites. Dust mites and bed bugs infest mattresses. Bed bugs, they usually come out at night feeding on sleepers which results in blisters and skin rashes. Humans spend about 8 hours in bed and one may get severe health issues if proper care is not taken. We shed dead skin cells and dust mites eat those. Having a quality mattress cover shall act as a protective barrier keeping these mites and bugs at bay. Buying a mattress cover for dust mites and bed bugs is a long term decision and numbers of factors play an important role in your purchase. Getting the right cover shall provide long term use and effective protection. Material Used: While considering mattress encasement there are different fabric options like cotton, non-woven, polyester, membranes or coated fabric material. Cotton has short fibers and over times these break down and weaken. They are not suitable as mattress covers. Polyester is durable with strong resistance to abrasion and resistant to mold, rot etc. but it fails to absorb moisture like cotton. It has a longer life than cotton and they don’t shrink with laundering. Non-woven materials are bonded together by mechanical entanglement and made from fibrous webs that are costly. Fabrics are stiffer, noisy and less comfortable under sheets. Coatings & membranes are not durable to stand long. The common fabric coating or membrane material is polyurethane. They hint that they are water resistant but if that is the case how will the moisture penetrate? This is important for comfortable sleep as we lose 8 ounces of liquid while sleeping. These fabrics are noisy, rigid and can get hot and clammy while sleeping as they aren’t moisture permeable. Quality Construction: How a mattress protector is constructed and materials utilized provide information of durability and effectiveness. The zipper should work well over repeated use. Seams should be reinforced and covered so as to provide additional protection against dust mites. Stitching is a vital factor of durability as well. Lock stitch method is best as it doesn’t unravel. Synthetic thread is better than cotton that breaks. They are strong having good chemical resistance. Synthetic threads with monofilament core are best for durability and strength. Warranty: Mattress covers are an investment and you would surely want to get one that lasts for years and provides protection. Cotton ones have 1-5 year warranty due to degradation of natural fibers with time. Get one with long term warranty that has simple return or replacement policy. Global Impact: After getting satisfied with the durability, size that fits and color that is most suitable, it is wise to look for those mattress covers whose assembly and fabric are from USA so your support American businesses and workers. 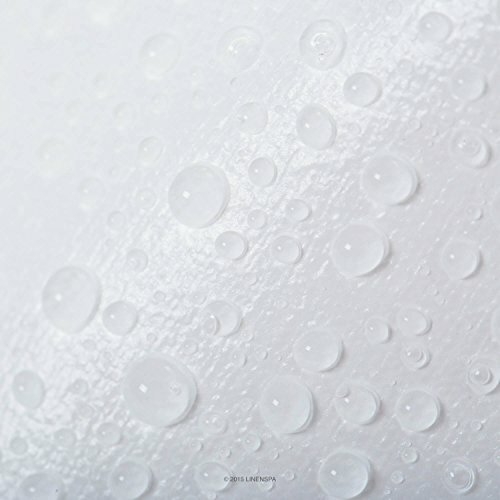 Ranking at the top among the choices for mattress covers for complete protection against dust mites, Pristine Luxury Dust Mite Mattress is made of top quality allergy-control fabric. It is a zippered mattress cover that entirely covers the mattress. Pristine Luxury mattress cover is made from using 100% polyester which has the smallest pore size available in the industry which is cool, soft and breathable allowing you complete comfort. This mattress cover is made to last with a life time warranty. The covers are sewn with double stitch, having at least 12 stitches/ inch. At number two we have LINENSPA Encasement Mattress Protector just like that offers complete protection to your mattress from all sides. 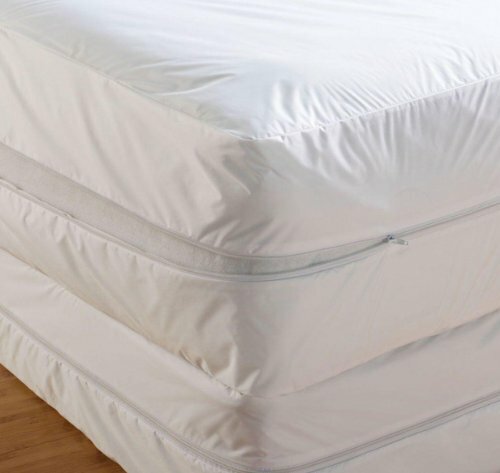 It is designed with a zippered end that covers your mattress from top, sides and bottom providing a reliable, thin barrier against dust mites and allergens. It is made of water-proof polyurethane layer that blocks all the spills and fluids so that your mattress remains stain free. 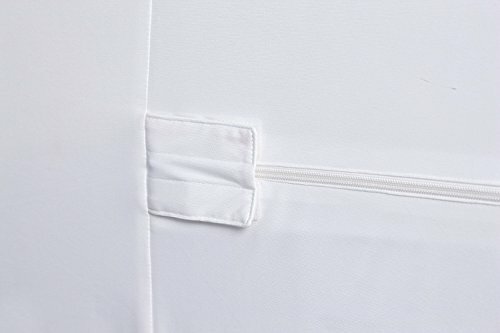 Encasement Protector from LINENSPA features a soft and noiseless fabric that allows cool temperature allowing air to pass through so you sleep comfortably. The Zippered Bed-Bug Proof Encasement by Utopia Bedding possesses a lot to offer to people. From protection against dust mites, bed bug infestation to preventing it from spills and fluids. It comes with a Velcro zip guard which provides a durable make; it has double hemmed stitching which adds to the care of your mattress. The zipper extends to three sides of mattress which makes it easy to remove and put on. The zip guard not only blocks mites and bugs but spores and other types of allergens as well. The hypoallergenic material that has been used in it helps relieving number of respiratory issues. It can easily fit a mattress having up to 115” thickness. This mattress cover is also quite amazing considering it has been selling pretty well. 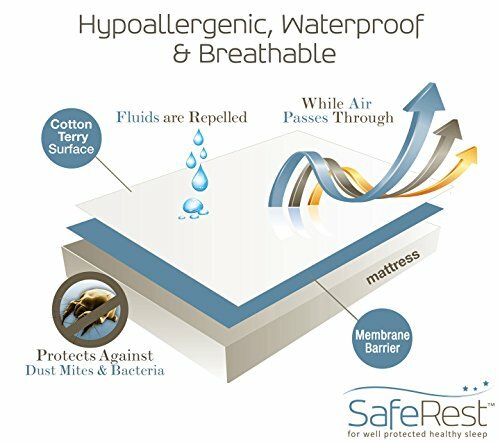 SafeRest Premium Waterproof Mattress Protector happens to have this reputation because it offers not only to your bed but to your health as well acting like an impermeable barrier. Made of cotton terry, it provides a soft and comfortable sleeping experience without any plastic feel or noise. It has been designed in the style of a fitted sheet that adjusts itself quite easily to the mattress. It protects you against all bacteria, allergens, dust mites and liquids. It is 100% machine washable. The cover is vinyl-free and hypoallergenic which protects you not only from dust mites but other bacteria too. The breathable material keeps you from overheating while sleeping. This waterproof mattress protector is registered as Class 1 Medical Device which keeps the shape and feel of your mattress the same while you rest or sleep. SafeRest Premium Hypoallergenic Mattress Cover is made without the usage of harmful phthalates or PVCs and come with a 10-year warranty.